The AA, which has saved £22m in IT running costs since the £50m contract began in 2005, believes it can now run its datacentre more cost-effectively internally. The AA has begun the transition from its £50m, seven-year outsourcing contract with IBM to bring its datacentre back in house. The motoring organisation, which has saved £22m in IT running costs since the contract began in 2005, believes it can now run its datacentres more cost-effectively internally. The five-month transition project will bring The AA's IT policy into line with that of its parent company Saga. Darragh O'Keefe, infrastructure strategy manager at The AA, said, "Saga does not believe you can save money by outsourcing." The AA will migrate the datacentre IT equipment it owns from IBM to its own datacentre between now and the end of June. It is spending £500,000 upgrading the air conditioning in an old AA business continuity site to take modern servers. The centre will run several business systems, including The AA's core customer database, Microsoft Exchange and SQL Server. The AA plans to take back 20 of the original 120 staff who transferred to IBM under the outsourcing deal and hire an additional 25 Unix, database and helpdesk experts - jobs that were previously run out of IBM India. The company outsourced its IT systems to IBM in 2005, following its demerger from Centrica. It has been able to reduce IT running costs from £54m to £32m during the contract. 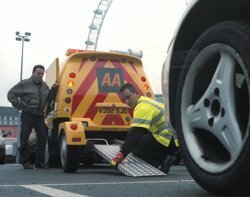 The AA made a big saving by settling on a lower level of availability than the industry norm. Datacentres generally look for between 99.9% and 99.999% availability. O'Keefe, said, "Using Gigabit Ethernet network links and asynchronous replication of data, we could achieve 99.5% availability in the datacentre," a number the business was prepared to live with. This means that if the company's Microsoft Exchange 2003 server fails, The AA can get an e-mail service running from the back-up centre within four hours its SQL Server database can be restarted in 15 minutes. Lowering the level of datacentre availability meant The AA could deploy NetApp's IP-based storage area network (San), which was 66% cheaper than a fibre-channel San. The AA made additional savings by consolidating its servers from more than 800 to less than 300. Tony Lock, principal analyst at Freeform Dynamics, said, "Companies that bring their datacentre back in-house can learn from the outsourcing supplier, which would have set procedures for running its own datacentres."